Knocking through for a knockout kitchen! They say that people don’t necessarily judge a potential new home by the number of rooms but by the available, usable space ie they would rather have 2 large downstairs rooms than 3 or 4 small ones. This very much applies to kitchens. One of the biggest issues that people have with their homes is that the kitchen is too small. Because a kitchen has to be functional by nature, this can be a real problem. If you can’t have the fridge door and the kitchen door open at the same time, you don’t have enough counter space to prep meals properly or you struggle to have more than one person in the kitchen at any one time then it may be time to think about solutions to acquire more space. We have completed a number of kitchens that have been created from extended space and trust us when we say that it makes a huge difference to the finished result. While we can of course create a really great kitchen in a smaller space, nothing has the wow factor like a large kitchen – especially when it replaces a much smaller one. There are a few different ways you can achieve this. The cheapest way is to extend into a room that is already there, such as a dining room or utility room. It’s amazing how many people want to hold on to having a separate dining room that they often don’t even use every day and then struggle in a small kitchen. As we said at the beginning of this article, people buy houses based on space rather the number of rooms – quality over quantity. If you can’t or don’t want to knock into another room, another option is to extend the house. This could be a traditional brick extension, a conservatory or an orangery which is a bit like a cross over between the two. The kitchen can be contained entirely within the new space or in the extension and existing kitchen space combined. You could even move another room into the extension, such as the dining room or living room, and this could give you that former space to knock into or even relocate the kitchen. A bigger space offers you different options. A small kitchen often doesn’t have much scope for changing the layout but a larger space often presents lots of opportunity to redesign the whole space. This will lead to a kitchen that functions much better and of course you will gain extra cupboard space, extra work space and usually extra room for appliances so you can have that American style fridge freezer or that dishwasher that you may not have had before. Dining space can still be incorporated so you won’t lose the function, even if you’ve lost the separate room. A good kitchen designer will present you with a number of options for layouts. An open plan kitchen can also be a much more sociable space. Instead of having to tuck yourself away on your own while cooking, other people could be sitting at the table or at a breakfast bar, or even helping you prepare the meal! If you have young children you can keep them occupied in there with you or at a dinner party you can still feel part of the group, even while fixing drinks or sorting the next course. Obviously an extended kitchen is a more expensive option as the kitchen is larger and there are building works to consider but you could argue that if you are going to pay for a new kitchen – something you may only do every 10-15 years – it may be worth investing the extra money to get a space that really enhances your home and how you live in it. If you are considering extending your kitchen then involve your kitchen designer from the first stages. We know our stuff and can give you key advice for planning the extension itself as well as the kitchen. At 3Style Kitchens we work with a number of trades and can actually manage the whole process, even building works, if that’s what you want. 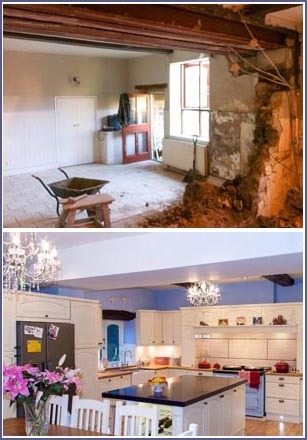 You can see in the main image the difference removing a wall made to this kitchen that we created for a customer. The existing kitchen was really quite small but removing a wall and designing a new kitchen in the whole space created an elegant, airy space with room for an island unit and a large dining table. See the full case study here. If we can help you plan your extended kitchen then please give us a call on 0800 321 3491 or request an appointment. 0 Responses to "Kitchen Trends Monthly Blog – September"